At Phoenix, we pride ourselves on supplying a 100% guaranteed non-sulphur treated herbal product range. We often get told that our dang gui doesn't look 'bright' enough. Unfortunately, the herbal market is saturated with sulphur treated herbs and many herbalists are accustomed to buying 'brighter' herbs as they are much cheaper. As a herbalist, you may have come across patients that have shown an allergic reaction to sulphur after taking herbal medicine. Sulphur is used to make herbs look more attractive, prolong its shelf-life and to kill any insects. However sulphur reacts with the herb and changes the chemical composition. We have compared sulphur treated Dang Gui (left) with our own Dang Gui (right). 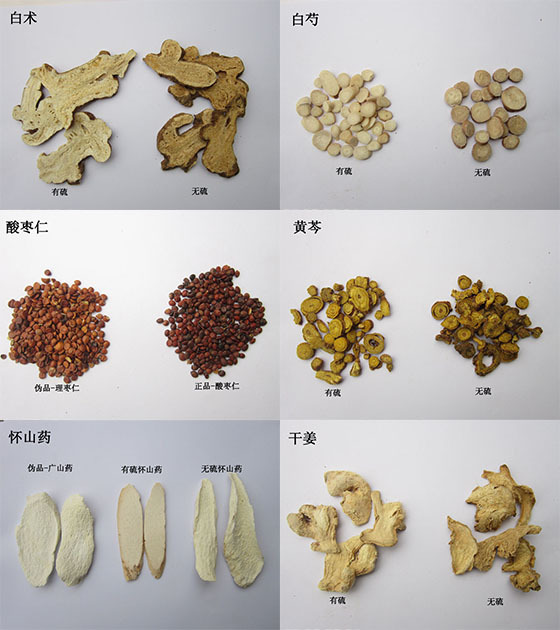 We have conducted studies on Bai Shao(Latin: Radix Albus Paeoniae Lactiflorae). 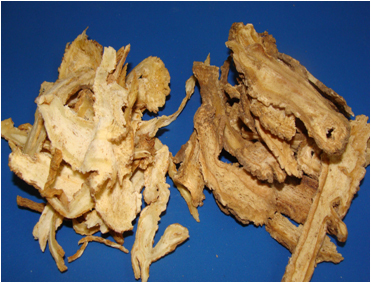 The results showed that sulphur reacted with the herb and produced a new chemical component, Paeniflorin Sulfonate, which was not present in the herb before. The active ingredient in the herb, Paeniflorin, which is used for treatment was also reduced by over half the concentration. The effectiveness of sulphur treated herbs are evidently reduced and so this in turn slows your patient's treatment down. The new chemical components are not supposed to be in the herb therefore there is an unwanted risk of adverse reaction to the herbs. There have been an increasing amount of studies on the effects of sulphur treated herbs on health and it is deemed an unacceptable method of processing. At Phoenix, we do not condone the sale of sulphur treated herbs. We strive to source the best quality dry herbs and concentrated granules available. Each batch of herbs is screened for the correct level of active ingredients and also for the correct chemical composition.